A homemade barometer can make an interesting science project for young students, or be a good at-home science project for children and parents to complete together. A barometer measures atmospheric pressure and will register changes that correspond to the weather at a given time. For this project, you will need a balloon, rubber band, coffee can or glass jar, tape, a drinking straw, a piece of paper and pen. Start by blowing up the balloon to stretch it, and then let the air out. While doing this step, consider the pressure changes as the balloon fills with air--higher pressure occurs as you force air into the balloon. Next, cut the balloon in half and discard the portion of balloon with the neck attached. For this step, be sure to have enough balloon to cover the top of the jar or coffee can comfortably and create an airtight seal. An airtight seal will ensure that your barometer will successfully measure pressure. Next, create an airtight seal by stretching the balloon over top of the coffee can or glass jar and sealing it with the rubber band. Ensuring an airtight seal is the most critical step. Any air leaks will affect the way your barometer will measure atmospheric pressure. The rising and falling of the balloon caused by air pressure changes will be the most obvious sign that air pressure has changed. Tape the drinking straw onto the middle of the balloon with the tape a small distance away from the edge of the jar or coffee can. When you complete this step, a few inches of the straw should hang over the side of the jar or coffee can. If necessary, part of the straw can be clipped for space considerations. Be careful when doing this step. The homemade barometer may be a little flimsy and moving the straw could result in improper readings. Place the finished barometer next to a wall with the piece of paper taped to the wall. Mark the current position of the straw, leaving space above and below on the piece of paper for the straw to rise or fall. This paper is where, over time, you can track the rise and fall of barometric pressure while noting the weather outside. Higher air pressure pushes the balloon toward the jar and will force the straw upward. When air pressure is lower, air inside the jar will force the balloon to rise and the straw to move downward. Check the straw regularly and note the position of the straw and corresponding weather conditions outside. Recording pressure changes in different weather patterns and seasons will provide students with a clear look at the relationship between pressure and the weather outside. 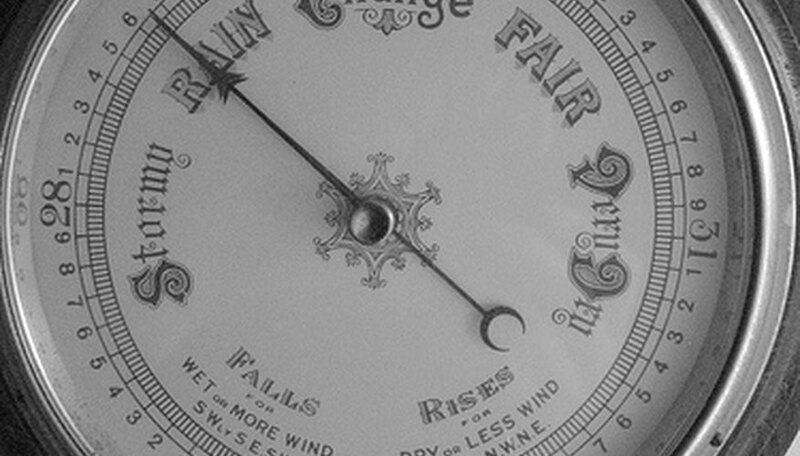 Barometers are used in weather prediction. Generally, high pressure will indicate fair weather conditions, while low pressure likely indicates a stronger possibility of storms. Green, David. "Free Directions for Making a Barometer." Sciencing, https://sciencing.com/directions-making-barometer-5372129.html. 24 April 2017.